By combining oral scanning, CAD/CAM design & 3D printing, dental labs can accurately produce crowns, bridges, stone models & a range of orthodontic appliances rapidly. For a growing number of dental lab owners, digital dentistry is already here, with 3D printing as part of the business strategy, dental & orthodontic labs can speed production while improving quality and precision. With the introduction WDM (wax deposition modelling) dentist can produce extremely precise wax-ups with incredibly fine detail and smooth surfaces, in a casting material that burns away clean for a beautiful final product with minimal post-processing. The technology is consistent, reliable and repeatable so you can create high-quality dental restorations every time, every day. WDM 3D Printers build smooth, detailed casting wax-ups by jetting tiny droplets of a wax-like material called TrueWax onto a build tray. Where overhanging shapes and complex geometries require support during production, the 3D printer deposits a removable wax-blend material called TrueSupport. Imaging: A dental scanner or CAD program generates a high-resolution 3D image to be exported as an STL file and prepared for 3D printing. Pre-processing: Specialized software automatically calculates where and how much TrueWax and TrueSupport material to deposit. Production: The 3D printer heats and deposits the materials onto a build plate, one fine layer at a time. After each layer is deposited, a fine rotary planer levels the build surface to ensure accuracy before adding the next layer. Post-processing: The support material easily melts away at a relatively low temperature to reveal a wax-up ready for immediate investment casting. VeroDent (MED670) provides amazingly fine 16-micron layer thickness, rendering small features in great detail; and excellent strength and durability. VeroDentPlus (MED690) also provides fine 16-micron layers, plus the best available strength and durability. VeroGlaze (MED620) is an opaque white acrylic material for realistic veneer models & diagnostic wax-ups that require A2-Shade colour match. In addition, Bio-compatible Material (MED610) is a clear PolyJet photopolymer medically approved for temporary in-mouth placement. Streamline in-house production of dental models, orthodontic appliances and surgical guides. The Objet30 OrthoDesk is specifically designed for small to medium-sized orthodontic dental labs & clinics. CrownWorx allows you to seamlessly transition to a digitized workflow so you can quickly and easily create quality wax-ups for crowns, bridges & other dental restorations. FrameWorx allows you to seamlessly transition to a digitized workflow so you can quickly and easily create artisan quality wax-ups for partial dentures. 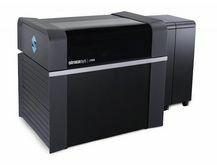 Maximise operations for large capacity aligner production with the new Stratasys J700 Dental 3D Printer.